Should be no problem as these are the same type of dxf files . Which cam are you using and pp ? What is your cnc type ? So, just send me the files as soon as you are back. There is no problem using post of 80mm. In that small place it is maybe even better. 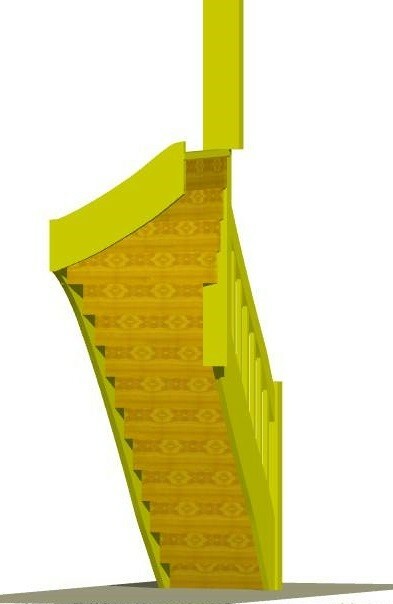 I corrected back the stringer of the stair and attached the new version. A wider nose on the first step is not a problem compared to all other steps. Let me know if you use this final version so that I can send you the files. It will be only this evening as I have to leave in a few moments. First I have to thank you, I’m both impressed and grateful that you used your Sunday to work with my project! I will never forget that. Like I don’t forget that Ness helped me out with my last stair even if he was occupied with some kind of course outside the reach of internet in that period. I read your post and have played around more with SD7 and like it more and more. Now I’m happy that I took the time to redraw it there. I have tried to study the stair and think me through the production and I think I can use it more or less like you draw it. Handrail from 50 to 40mm. And, when I study it in wireframe I saw that the first riser penetrated the post in a way that would have left a very thin amount of material in front of it. But when I changed the nosing of the first step from 50 to 59.5mm I liked it more. 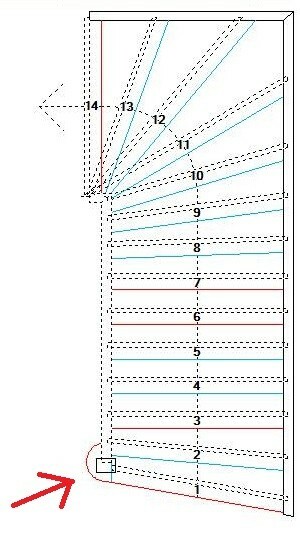 Do you think it will look strange if the first step has 59.5mm nosing and the rest has 50mm? After that I was happy, almost. Then I began to think more and more of the posts. Originally I had meant to use 80mm posts so I could just glue it together of 2*40mm material. But when I saw it was 90mm posts in your drawing my first thought was that I think I have enough 25mm material lying around so I can make them from 25+40+25mm. I tried to change the posts to 80mm and except for the stringboard that got bumpy again it didn’t seem to mess up anything. Only thing was that I had to change the nosing even more (to 63.5mm) to achieve the same effect. Now I’m a bit unsure so I add both the file with the first minor changes and the file with that + the 80 posts. If you see a major disadvantage with the 80 version I go for 90 posts. 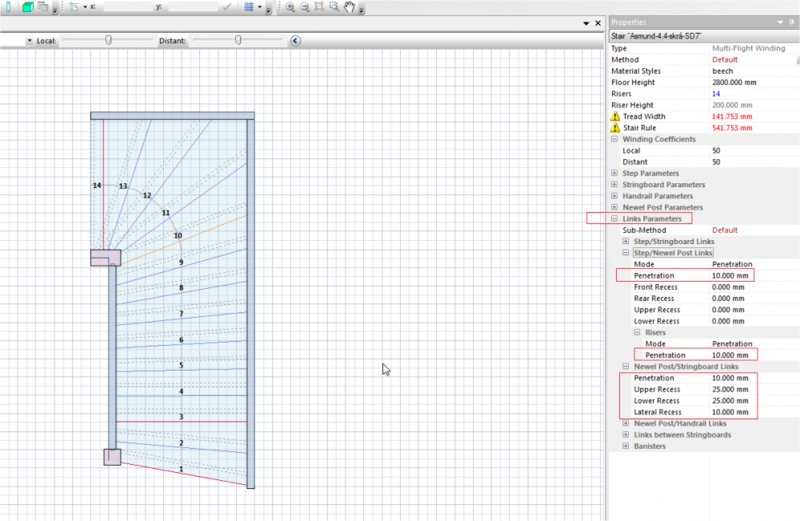 2 On the 2D screen you have all parameters in the properties screen. 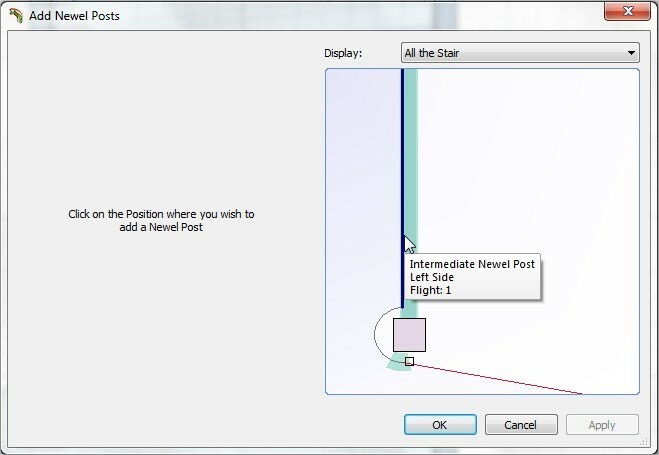 There you can define the parameters of each part but also the interconnection which you can do in the links parameters. 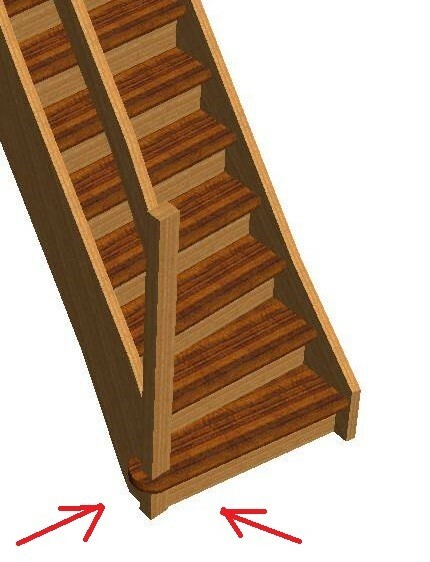 This is for the complete stair. 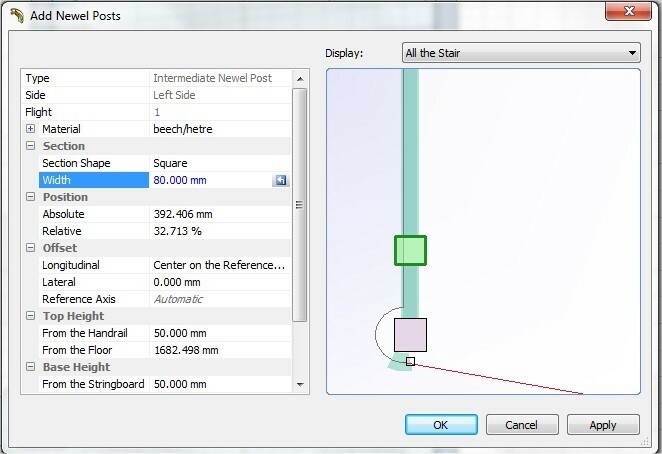 You can select each piece individually and preset other parameters for each part. 5 A balustrade on the same stair is currently not possible. 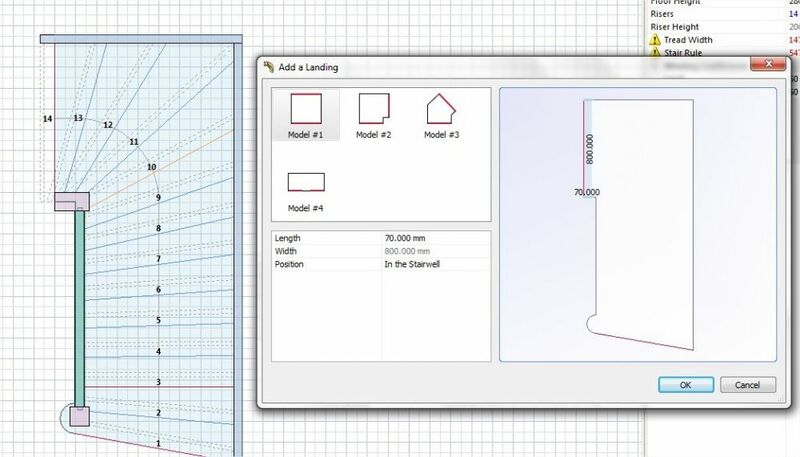 You can draw one as a separate file and put them together in sketchup to see the result. 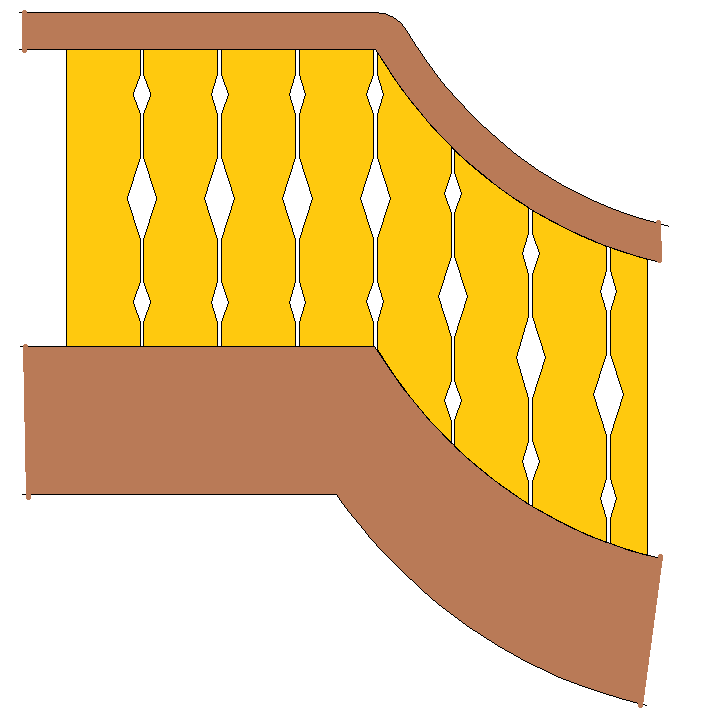 I added an example of balustrade I made. 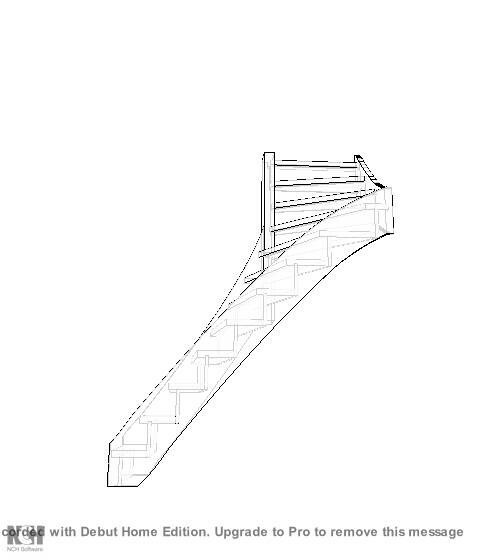 I also added the first post on the stairfile and then draw the balustrade to connect. But that I will make in my CAM as shown an example of in post number 3. Sorry for the late reply, it has become much less time to work on the laptop than I predict so far on the holiday. Just a few minutes now and then. I have regretted it several times but I ended up trying to redraw the whole stair in SD7. All in all I guess 7 is better than 6, but of course, when you have been used to doing things in a certain way it can be difficult when you have to look at other/new places for every little thing you want to do. 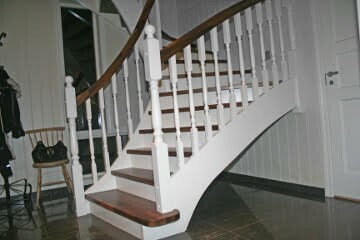 About the newel position on the first step, it might been wrong but it stands there for a reason. 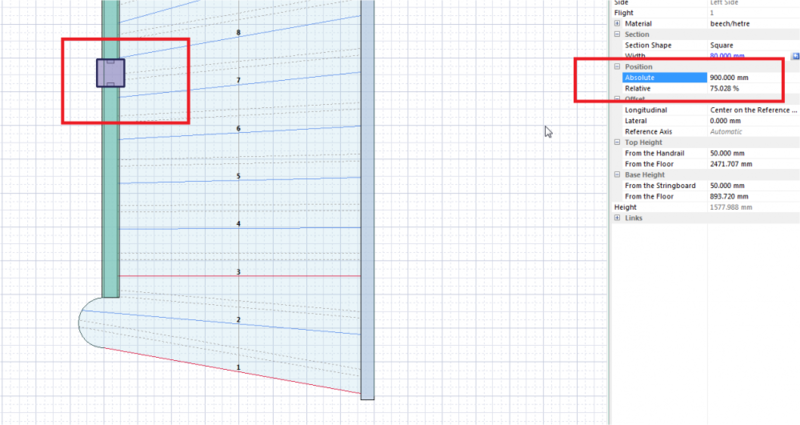 I manage to draw that in SD6, but in SD7 i can’t figure out how to do it? But long story short about the newel position, someone convinced him that it might steel to much of the limited space in the hallway in the ground floor so we took it away. But when I removed it I thought that it might be a good idea to let the newel be as long “back” as possible so he can get quicker up the stair when he came from the door marked “ID1” or bathroom. 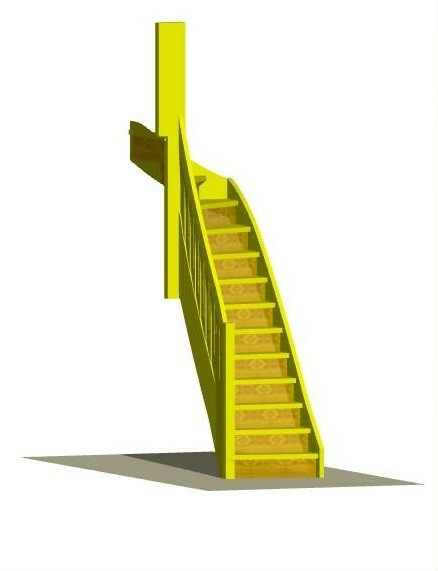 For this stair I think I will stay with the 40mm because I have all the material ready in my workshop and I don’t have the time to wait for new materials to be made for me. How can you set a general penetration depth in SD7? I guess 15 or 20 mm penetration is enough, but I’m not sure what SD7 has chosen for me? On the 3D-Wireframe it looks deeper than 20? Maybe 30? Here (on the picture below) I have tried to draw some more of the rooms around the stair room from my memory (the complete, original drawing is at my home). There you see it is some limited space and the traffic to the stair will be from 3 different directions. 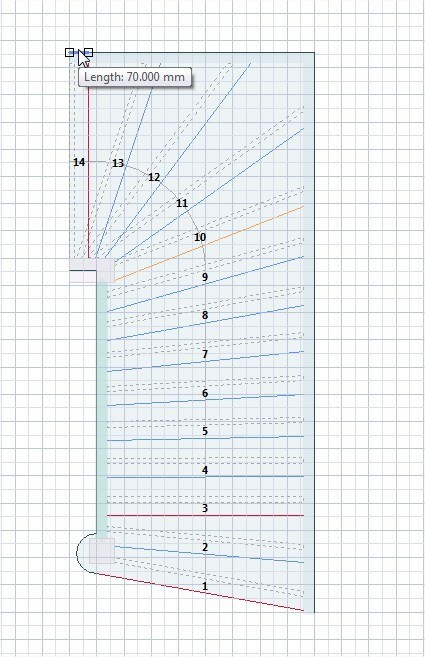 That’s the reason for the angel at the 2 first steps and the newel as far back as possible. My customer is fortunately prepared for the stair to be steep, we just have to do the best out of the limited space available. Remember, this drawing is from ground floor. 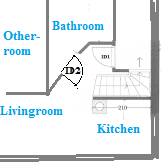 First floor and basement is just open rooms without walls. 1. 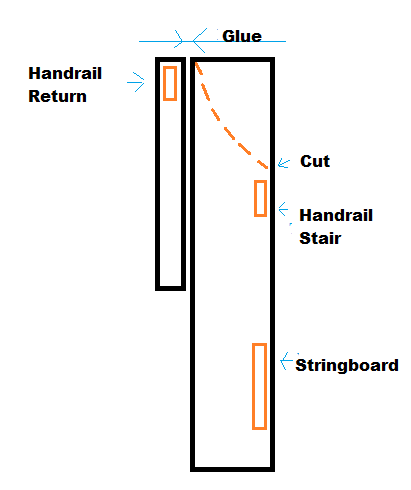 When I set an angel of 10 degree at the 2 first step, the stringboard (and handrail) became kind of bumpy. Is it some easy way to smooth them out again? 4. 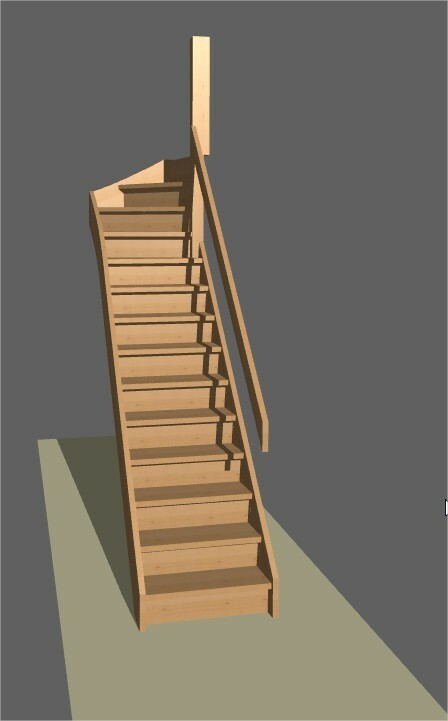 The nose of step nr3 has to be straight because I will make a simple version of the same stair for the basement where I just remove step 1 and 2 in my CAM. But for step number 4 to 9, would you have preferred them straight, or winded as SD7 suggests? 6. 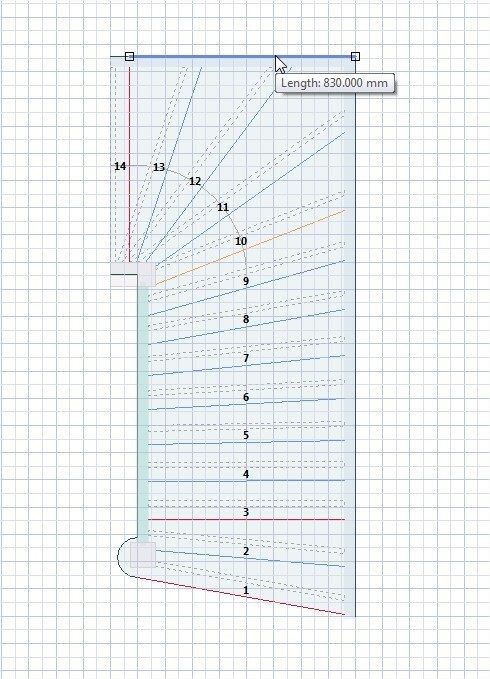 I have not decided about the newel jet, but I tried to move it around and SD7 don’t allowed me to move it more than I have done in my example file (40mm), is it a way around this limit? There is not much you can do to make the steps deeper. If you remove one your step height will go to 21.5 cm which is too high. The only thing you can do to enlarge the steps is increase the stepnose. But this will not change the tread width. You have a little more comfort going up but going down remains the same. 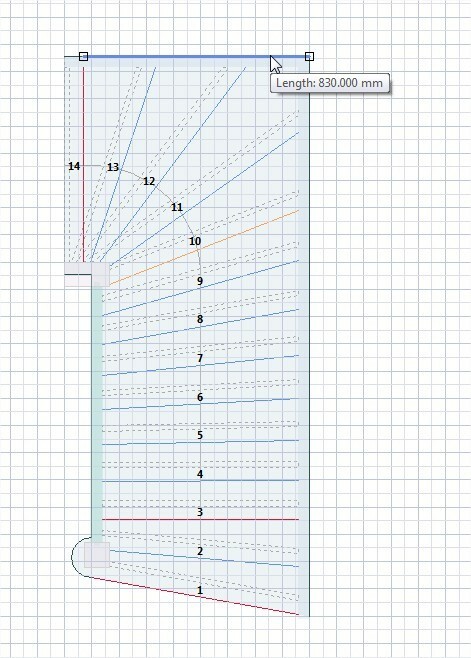 I changed the newel position on the first step as it was wrong. So check the steps when you increase the stepnose . You may need larger stringboards. 50mm is a standard and I do not advise to enlarge it too much. Also you have no landingstep which means that the last step is your upper floor. Will my steps be “deep” enough (because of the riser) for comfortable walking? Should I use 20 or 40mm thick post instead of stringboard/handrails in the top left? 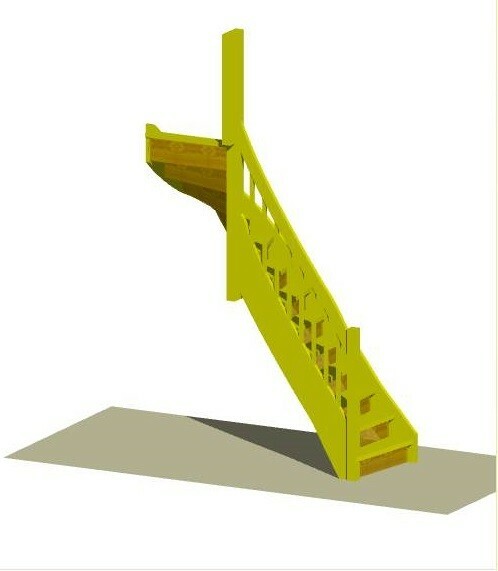 Do you think 20cm riser height is ok for this stair? The stair is very steep and in such situation a riser is taking away some comfort as you cannot overpass the step when walking on it. 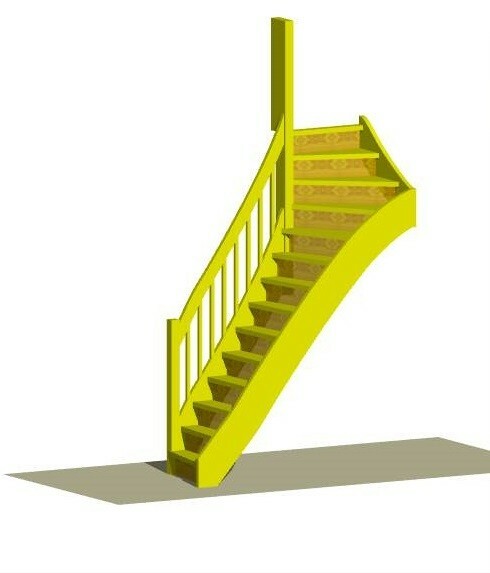 So if you can do an open stair without risers comfort will be better but still remain steep in use. 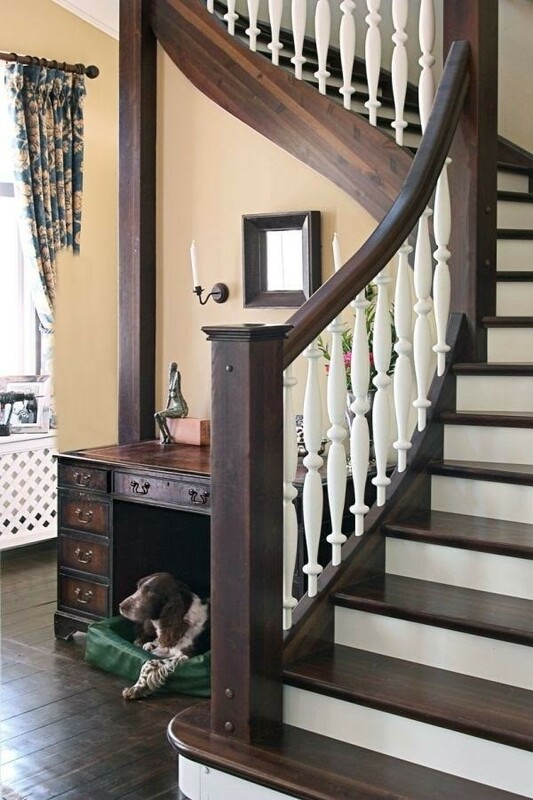 Why using such a wide post and reducing the width of your stair ? According to the plan I see you stair ends on a door opening or Do I see it wrong ? I suppose you do not have any handrail return then. 20 cm riser is OK. It can vary between 18 and 21 cm. I would not recommend ever to go over 21 cm. In your situation you have no choice unless you can add length on the stair. 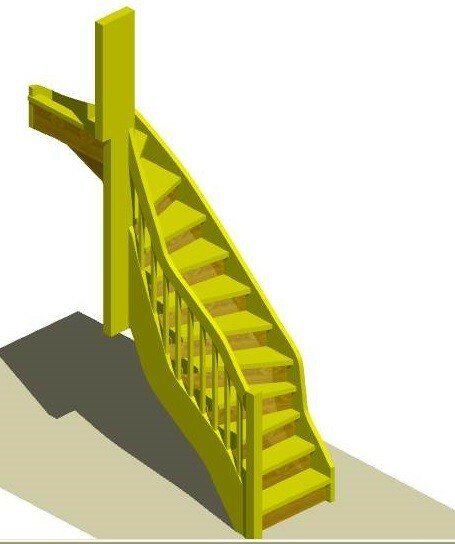 I added a model made with the new stairdesigner 7 which is much better than version 6 you are using. 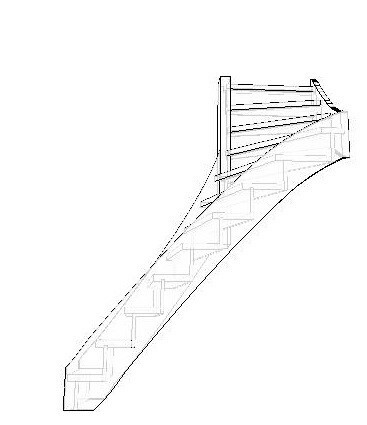 There you can see that you can use the complete width of the stairwell and make a 90° turn with a possibility of handrail return. You can take a look at the 3d model. If you download sd7, you can open the stairfile too. I tried to download SD7, but I could not find any downloadbutton on the download-page?!? Only for making new membership. I will try a couple of times more, i guess I’m overlooking something 😛 It could have been a good thing if i could download it now from home with “free” internet, but maybee I could find som free web on vacation to. I should have eksplained more aboute the drawing of the room, the drawing is from the first floor. 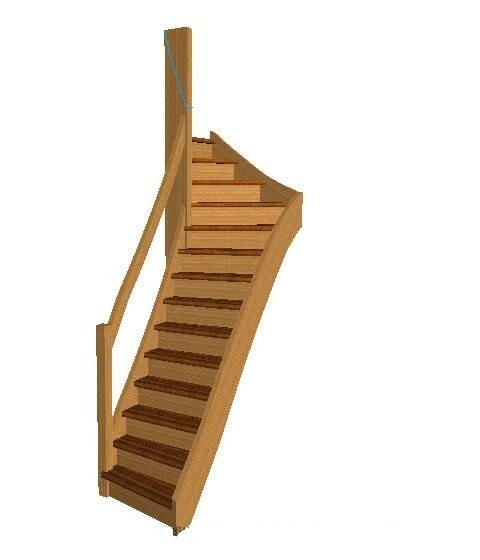 In the second floor it’s just a big room without walls so yes, it will be return handrails 🙂 But “the bonus stair” from the basement will end up in the door you see in the drawing. 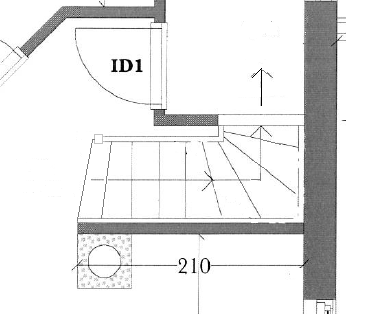 About the width of the stair.., it’s several small reasons for the stair to be 80 and the room 90, the best i can remember here an now is: 1.to save space in the small hallway at the bottom of the stair. 2. 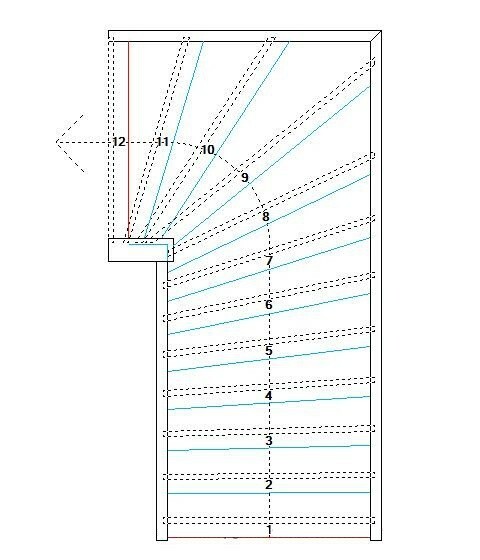 Because of the type of baluster the handrail have to be vertical to the stringboard and i guess it’s good to have some space between wall and handrail 🙂 It’s a couple of more good and not so good reasons to but I guess the two I mention is the main. Seems like my .sds file don’t want to uppload? The project now is a new cabin that shall have a stair from first to second floor and a similar stair from first floor down to the basement. 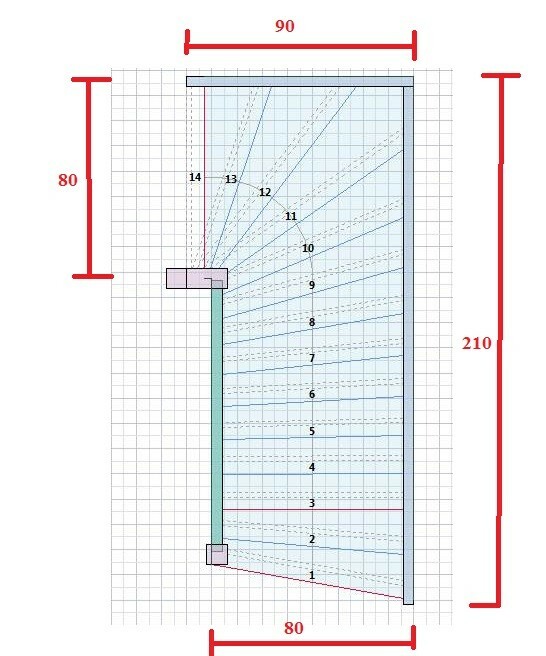 The distance (floor-floor) from first too second is 280cm and from the basement to the first floor is 240, my plan is to use a riser height of 20cm so I can just remove the two bottom steps in my CAM and use the “same” stair for the basement. 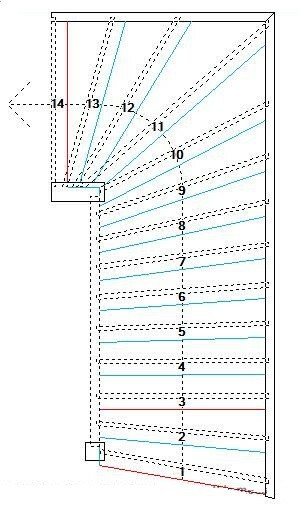 The “stair room” have a width of 90cm but the stair shall only be 80cm so it will straighten out 10 cm after the turn in the top. Instead of making a microscopic stringboard and handrails I thought I could make a wider post and make a nice, tilted cut on top of it. And glue the post together with the first post to the railing around the hole.